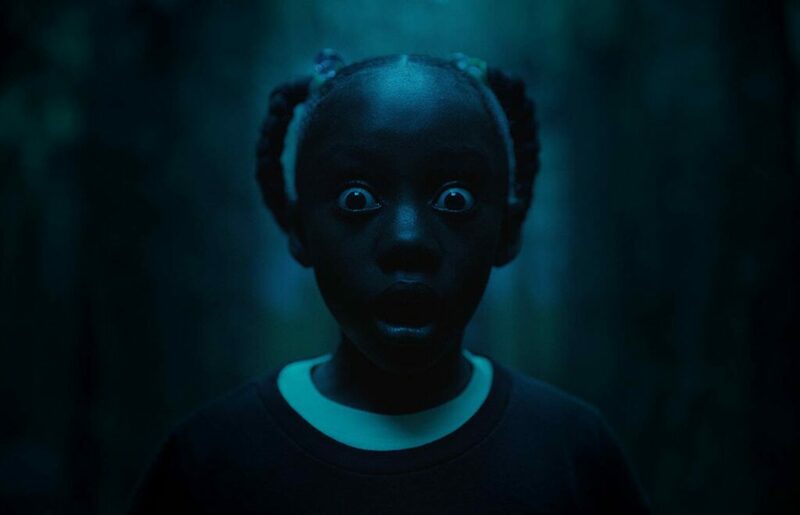 Jordan Peele’s followup to his Oscar-winning “Get Out” continues a provocative filmmaker’s exciting career. Lurking within us is another side, another you lying in wait, hiding underneath, looking for the right moment to kill off the other and take over. 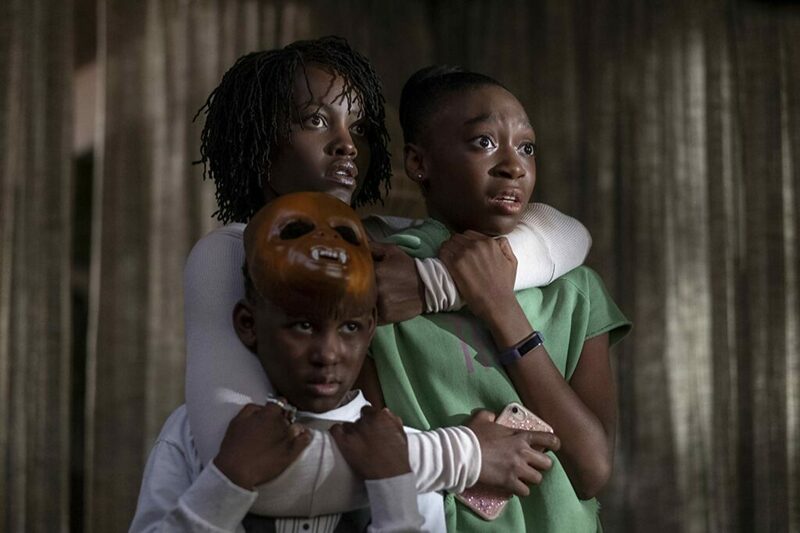 Whether you view Jordan Peele’s second feature literally or see it as a metaphor for class disparity or mental illness, “Us” will provoke a myriad of spirited conversations among viewers. 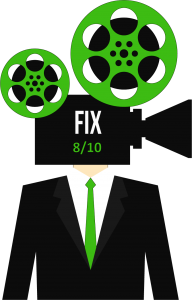 In the screening I attended, audiences were chatting it up even while the film was rolling. This was distracting, but since Peele aims to be a genre provocateur, such breach of theater etiquette is expected, maybe even encouraged. 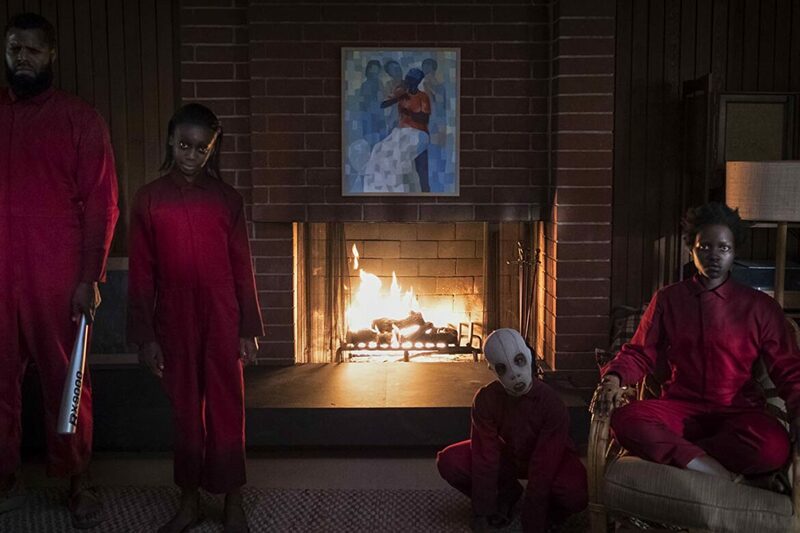 As a horror film, “Us” is more frustrating than scary, but it does succeed on the surface to elicit a measure of thrills and chills. The spatter-gore on display checks a box for the average student of all things “Walking Dead,” for example. And the story should be very familiar to a generation raised during the exponential resurgence of the zombie genre, given birth by the late George A. Romero in 1968. Lupita Nyong’o plays protective mother Adelaide. 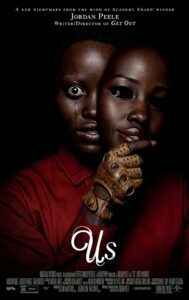 When the upwardly mobile Wilson family travels to their beach home for the summer, the family matriarch, Adelaide (Lupita Nyong’o), grows more and more uneasy. As a child Adelaide had a traumatic experience at the beach near the summer home. The feelings of that day, where she got lost in a house of mirrors attraction, still haunt her. Adelaide’s husband, Gabe (Winston Duke), and the kids, teen daughter Zora (Shahadi Wright Joseph) and younger son Jason (Evan Alex), are looking forward to hanging out at the very same beach. Of course, a day by the ocean doesn’t help Adelaide’s nerves. After braving the sun and sand, the Wilsons return home. And that night, they have some unwanted visitors. It starts as a creepy and violent home invasion. Anyone who’s seen the film’s frightening trailers immediately get the idea. But, uniquely, the Wilsons are attacked by a family that looks exactly like themselves. Thrown by this fantastical collection of doppelgängers, the Wilsons are easily overcome as they clumsily flail about, grasping for safety and understanding. However, Adelaide has seen this kind of thing before. A childhood trauma helps prepare Adelaide for the appearance of the others. Unconventional and mysterious, “Us” takes viewers on a bloody and murderous ride through the eyes of the survivors. We know little of the origin of the deadly doubles that pour out into cities and towns throughout the country, but they are soon everywhere, armed with a long pair of scissors at the ready. And their awkward movements and homicidal tendencies are equally confusing to anyone who is unfortunate enough to encounter them. Equal parts silly and profound, “Us” uses a zombie-like, end-of-world narrative to suggest many things. And given Peele’s previous film, 2017’s Oscar-winning “Get Out,” it is impossible to read this effort in a vacuum. “Us” could be about class inequality, immigration, mental illness, or some kind of riff on the internal conflicts in which we fight within, with the devil on one shoulder and an angel on the other. No matter how you read it, Peele has smartly not given us any of the tell tale keys. There’s no political ideology articulated. Race is never an issue, from what I could discern in one viewing. And there’s no overt mention of a grand corporate conspiracy at play. In a dual role, Evan Alex comes to grips with himself. 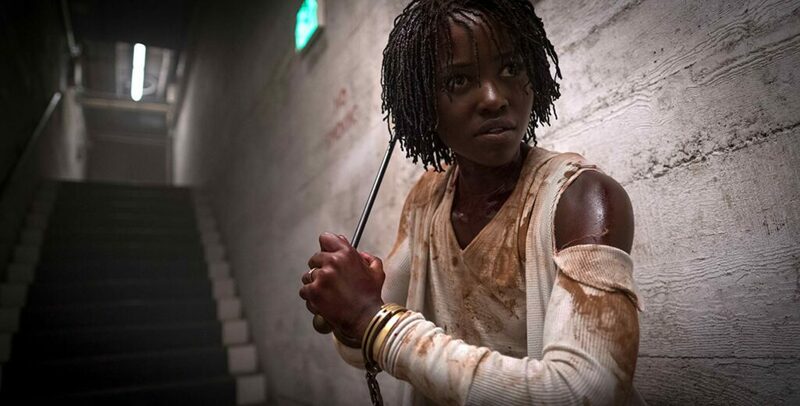 But into this violent, apolitical narrative, Peele, who both writes and directs, hints at a mysterious “they,” who created and trapped the deadly doubles hidden in underground complexes. Making concrete sense of all the craziness is not intended. But as something of a roadmap, the movie begins with a title card that tells us that there are tunnels everywhere under the United States, many of which serve no identifiable purpose. Such is Peele’s meandering story, that we see and experience like any other on-screen participant. And Peele smartly makes us all survivors, condemning us, like the Wilsons, to grapple with all the nagging questions. “Us” is tense, but not necessarily because of the mayhem that takes hold on screen. The score led by composer Michael Abels could very well be one of the coolest and most effective since last year’s “Blackkklansman.” A combination of pop hits and piercing orchestrations, the music both informs on the action and plays colorfully in contrast against it. It’s a masterful use of score that ratchets up the thrills and puts anyone in the theater gleefully on edge. And to that extent, a casual viewer can just sit back and enjoy the journey. Investigating the mystery, Adelaide (Nyong’o) ventures into the tunnels beneath. But Peele clearly aims for something weightier than just another goofy zombie-esque experience. He’s commenting I think on the current climate, in which children, just like our own, are placed in cages, separated from their parents, who, despite their language and country of origin, are just like us. 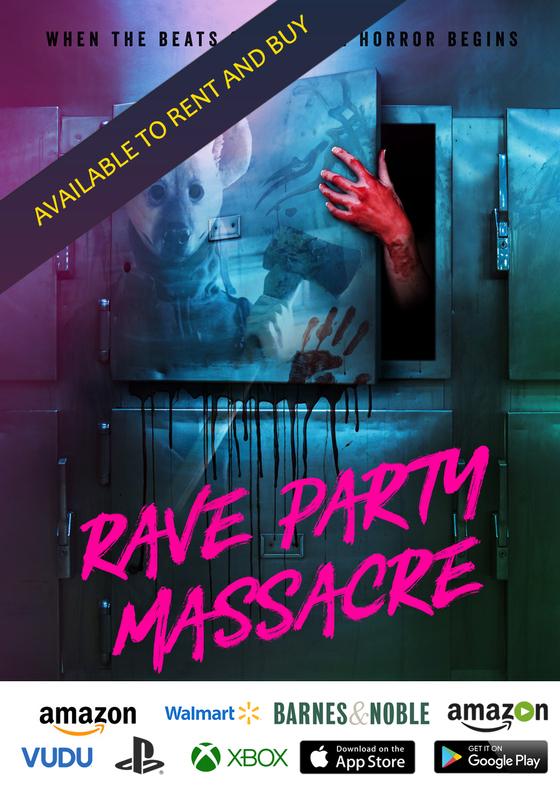 There are scenes in a subterranean compound, where we seen rows of school desks, a black board, and for some unexplained reason, a number of plump rabbits assembled in cages along the classroom walls. Just what is going on in that dank place? What were these children, later adults, being taught? The idea of a parallel society that is a shade less than our own and intentionally oppressed isn’t anything new to the metaphorical political and economic discourse. It is, after all, the oppression that eventually bubbles over inducing change. And change hurts. Peele wants us to feel the pain.